Wash and chop vegetables. You can choose different vegetables, depending on your personal preference. Put in a blender, add shallots and garlic, and blend until finely chopped and well combined. Heat some olive oil in a deep pan, then add vegetable mixture and fry on medium heat until liquid has evaporated. Add chopped tomatoes from the can, and season to taste. Add fresh herbs, like parsley and basil. If you like it hot, add some chili. Simmer until the mixture is homogeneous and has thickened. Set aside to cool down. Pre-heat oven to 200°C/400°F. 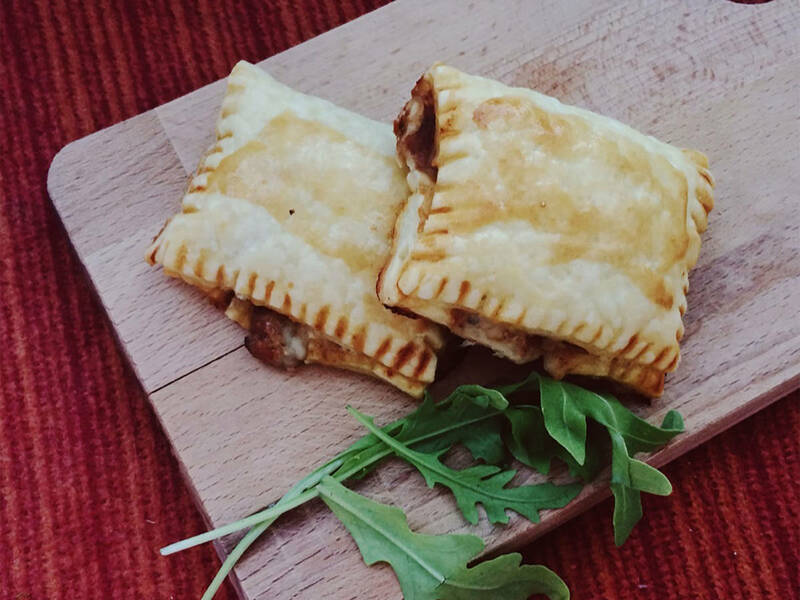 Roll out puff pastry sheets and cut equal-sized rectangles per sheet. Put some of the vegetable filling and a small piece of mozzarella in each center. Brush some egg yolk on the edges, fold the puff pastry, and seal with a fork. This will give you a pretty pattern. Brush some egg yolk on the surface. Fill each pocket and bake at 200°C/400°F for approx. 15 – 20 min. until golden. Serve with fresh arugula, and enjoy!